Western blot analysis of whole cell lysates probed with bcl-2 antibody (VMA00017) followed by detection with HRP conjugated Goat anti Mouse IgG (1/10,000, STAR207P) and visualized on the ChemiDoc MP with 67 second exposure. Arrow points to bcl-2 (molecular weight 26 kDa). Western blot analysis of COS-7 whole cell lysates probed with bcl-2 antibody (VMA00017) followed by detection with HRP conjugated Goat anti Mouse IgG (1/50,000, STAR207P) and visualized on the ChemiDoc MP with 300 second exposure. Bcl-2 antibody recognizes Apoptosis regulator bcl-2. The antibody has been extensively validated for western blotting using whole cell lysates. Mouse anti Human bcl-2 antibody recognizes the human apoptosis regulator bcl-2 oncoprotein, a 239 amino acid integral single pass membrane protein containing 4 BH motifs which lies within the cell rather than on the cell surface. The protein is localized to the outer mitochondrial membrane and plays a role in the inhibition of apoptosis. Mouse anti Human bcl-2 antibody reacts with small B lymphocytes in the mantle zone and many cells within T cell areas. Very few cells in germinal centres are stained. In the thymus many cells in the medulla are stained but the cortex shows weak or negative staining. In non-hematopoietic tissues few cells are stained (Krajewski et al. 1995). The antibody reacts with neoplastic cells of follicular lymphoma and anaplastic large cell lymphoma (Reed 1997). 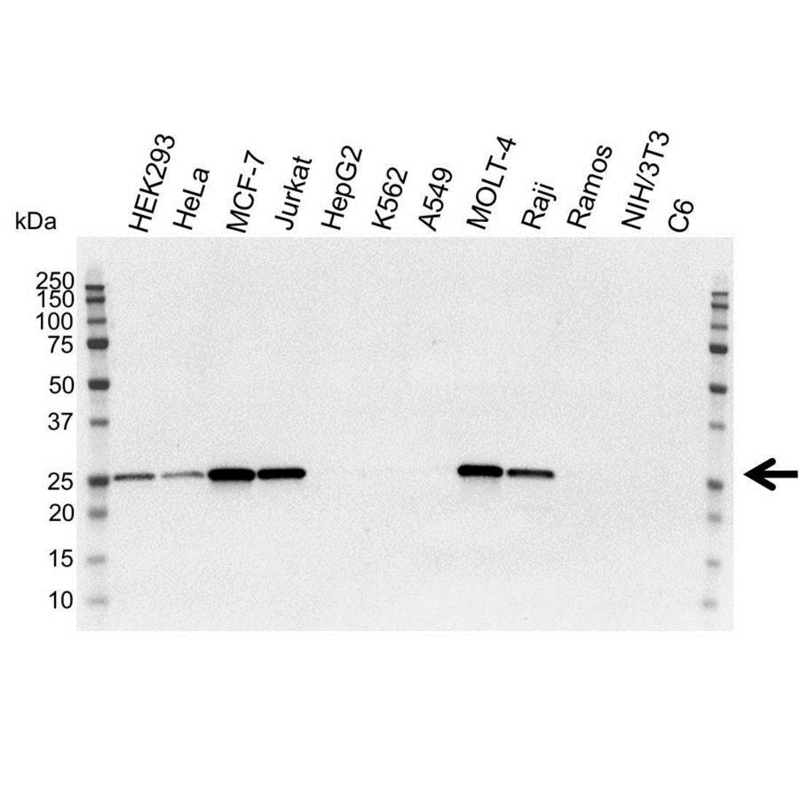 Mouse anti Human bcl-2 antibody recognizes bcl-2 as a ~26 kDa single band by western blotting in various human cell lysates and the COS-7 cell line. Anti bcl-2 antibody detects a band of approximately 26 kDa in Jurkat cell lysates.